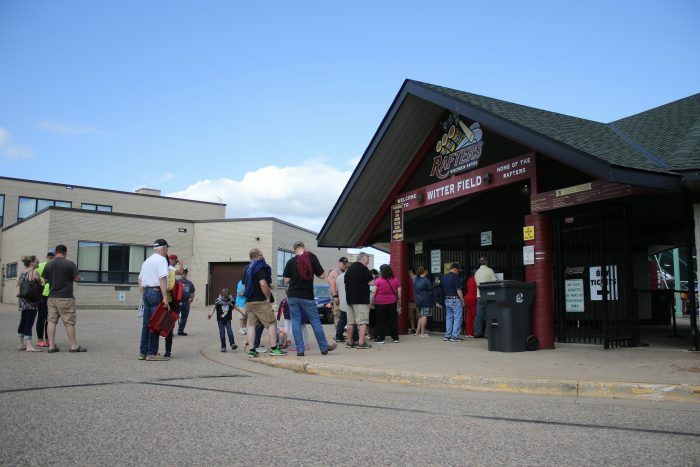 Wisconsin Rapids, Wis. – The Wisconsin Rapids Rafters (34-37, 19-17 2nd half) defeated the Green Bay Bullfrogs (38-44, 16-20 2nd half) 8-3 in the 2018 season finale. The Rafters took the lead in the first and never looked back, holding the lead with a plethora of offense. The cranberry and gold got the party started in the first. Three runs scored on three hits. Jack-Thomas Wold (UNLV) delivered a base hit to bring in the first run. Alex Fedje-Johnson (Davidson) added another with an RBI sac fly to center and Mitch Mallek (St. Cloud State) topped it off with an RBI single. The Rafters struck again in the fourth as Mallek scored on a wild pitch and in the fifth, two runs came in on a hit from Alex Fedje-Johnson. With a 6-0 lead in the sixth, The Rafters allowed three runs to Bullfrogs on two Rafter errors. Wisconsin Rapids pushed the lead up to five in the eighth. A Jordan Wiley (Kalamazoo College) single and two Bullfrogs errors made it 8-3 Rafters. Trayson Kubo (Stephen F. Austin) closed the door with a scoreless eighth and ninth innings. Brecken Lewis (2-3, 5.01 ERA) earned the win as McKinley Moore (0-4, 9.12 ERA) suffered the loss allowing six runs in five innings. The Wisconsin Rapids Rafters want to thank everyone for a memorable 2018 season.